Home / Entertainment / Video / Eat Bulaga Problem Solving: How's older Efren Bata or Megan Young? Eat Bulaga Problem Solving: How's older Efren Bata or Megan Young? Watch how the Problem Solving team answered the very confusing tweet from a Dabarkads. This is another hilarious episode of Eat Bulaga! 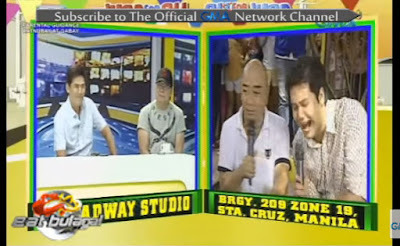 One of Eat Bulaga's funny segment was the Problem Solving, where in the hosts Jose Manalo, Paolo Ballesteros, Wally Bayola with guest host Marian Rivera would give advises from the problem of some of the residences of the barangay. They would also answer some problem questions from Twitter or Facebook. It was really a hilarious segment because Jose and the rest of the Dabarkads loves to say jokes and tease the residences. They give non-sense advises that makes everyone laugh! In one of its episode, a Dabarkad tweeted,"Sino po ba ang mas matanda? Si Efren Bata o si Megan Young?" Everyone from the Broadway and the barangay couldn't help but laugh because of the question. Honestly, it was really a funny and confusing question. Jose said the Efren Bata is younger because he still has no teeth, which is true because Efren's front teeth were already gone. Netizens loves this segment because of different funny problems from different people. Sometimes the Problem Solving team would give a helpful yet funny advises but they often make every problem a joke one, that makes the segment so hilarious! How about you? Who do you think is older between Efren Bata and Megan Young? Comment your answer below!